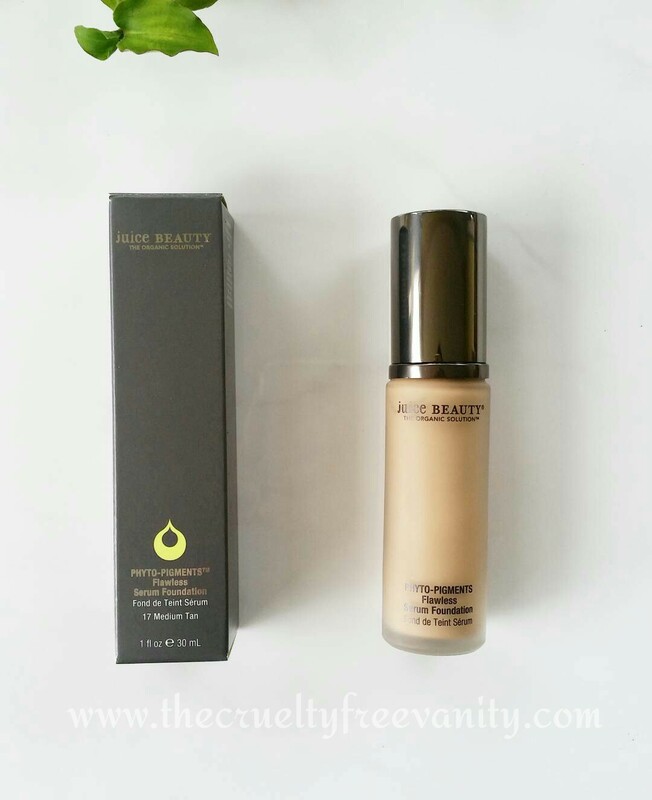 Today's post is an update on the new Juice Beauty Phyto-Pigments Flawless Serum Foundation. I have a first impressions video on this product on my YouTube channel, which you can watch here. I was super excited when Juice Beauty released their new Phyto-Pigments makeup line in collaboration with Gwyneth Paltrow. I was beyond happy to learn that the whole Phyto-Pigments collection is 100% vegan. I knew then that I wanted to try everything! I did pick up a few of their new products and will be doing separate posts on those later on. Alright now on to the review. This foundation is cruelty-free, vegan and organic. Also rich is antioxidants, has an age-defying serum built in. Formulated without silicones, talc, parabens, synthetic fragrance, artificial dyes and other nasty ingredients that you don't want to be slathering on your skin. Price: $42 for a 1oz sleek glass bottle, depending on where you get it from. I got mine the day that it was released on the Juice Beauty website for 15% off with a coupon code. If you are new to Juice Beauty you can sign up to their email list and they will send you a 15% off coupon for your next order. If you buy it at Ulta I'm sure you can use your points to get it cheaper. Where to buy: You can find this foundation at Ulta (website & some stores) or Juice Beauty's website. Buy it from Ulta here or from Juice Beauty here. Finish: Flawless dewy, healthy looking finish, depending on your skin type. It's definitely dewy on me, due to my combo skin. Coverage: Claims to be med to full, but on me is light to med. 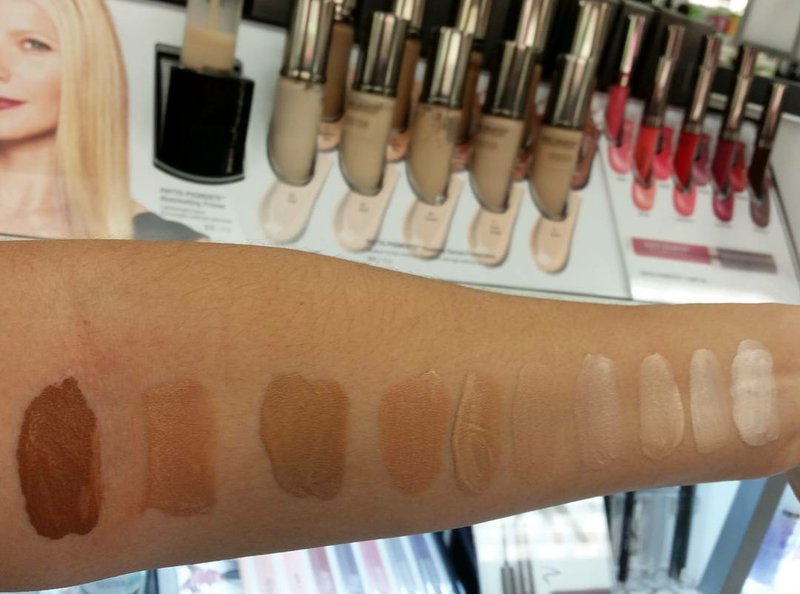 Can be a full coverage if you apply more layers. Of course, this also depends on what your definition of full coverage is. Since my skin is fairly clear I only use one layer and I get my desired coverage. Lasting Power: I get around 8 hours of wear, I don't normally keep my foundations on for more than that. Here is a photo of what Medium Tan looks like with all my makeup on. Now let's get to the Pros & Cons. * It's Vegan, Natural & Organic!!! *Lightweight, very comfortable to wear. *It goes on smoothly, blends nicely. *Reduced my redness & fine lines. *Does not settle into my fine lines nor does it cling to my dry patches. *Love the flawless finish, although there is no shimmer, it gives a radiant healthy looking finish. *The packaging is very nice, with a frosted glass bottle and gun metal finish cap (has a pump). * Free from lots of toxic ingredients. *They got 10 shades from very fair to deep skin tones. The photo below isn't a great swatch photo, but I tried my best. From left to right (dark to light): 29 Deep, 26 Tawny, 23 Medium Tawny, 20 Golden Tan, 17 Med Tan, 14 Sand, 11 Rosie Beige, 08 Cream, 05 Buff, 02 Fair. I only found one con, it gets pretty shiny at the end of the day. Maybe after 4-5 hours of wear, I notice that my skin looks shiny but not extremely oily. My t-zone is what gets the shiniest, due to it being oily to begin with. I'm sure if I were to set it, I would not get as shiny, and of course, some blotting papers help with that issue. It is not a deal breaker for me but if you are very oily, this foundation might look super shiny on you. I didn't know if these were a cons or pros so I'm just leaving them here, just FYI. *It did oxidize on me, meaning it got darker about an hour after I applied it. *Shake well before using it to mix the serum and pigments together. 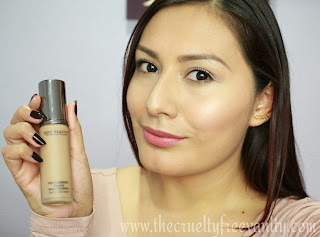 Overall, this foundation is an amazing everyday base. It has become one of my favorite foundations for sure. I did stop using it because it's darker than my skin tone at the moment, but I will be using it in the summer. I forgot to mention that I bought the shade, Medium Tan. I definitely recommend this product, so check it out for yourself. Have you guys tried this foundation? If so, what are your thoughts?